Mehran University of Engineering & Technology, Jamshoro Sindh. 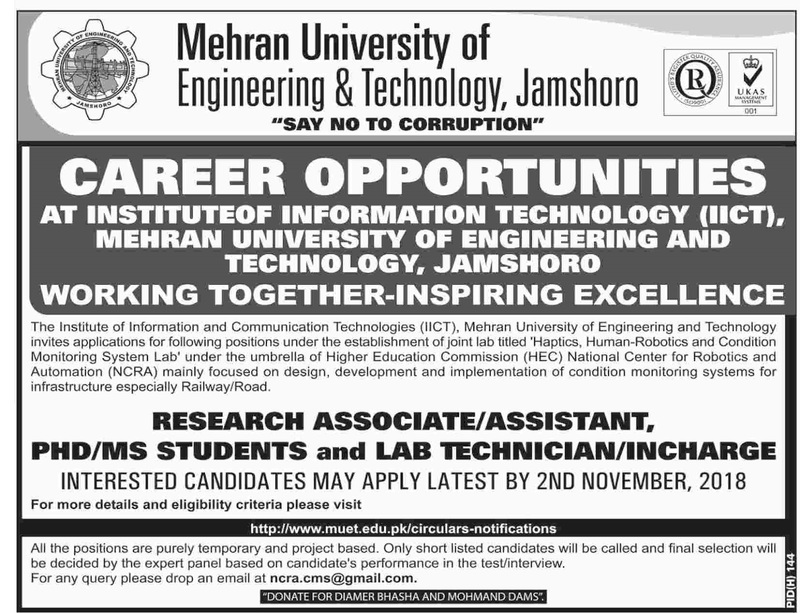 The Institute of Information and Communication Technologies (OCT), Mehran University of Engineering and Technology invites applications for following positions under the establishment of a joint lab titled 'Haptics, Human-Robotics and Condition Monitoring System Lab' under the umbrella of Higher Education Commission (NEC) National Center for Robotics and Automation (NCRA) mainly focused on design, development and implementation of condition monitoring systems for infrastructure especially Railway/Road. Qualification: PhD/MS STUDENTS WILL BE PREFERRED. All the positions are purely temporary and project based. Only shortlisted candidates will be called and final selection will be decided by the expert panel based on the candidate's performance in the test/interview. For any query please drop an email at ncra.cms@gmail.com.